Initially, I was excited when I saw this headline, Meet the startups that are giving everyone affordable access to justice. Great, I thought — an article that finally recognizes what solos — who are, after all, start-up lawyers – are doing to ensure that meaningful access to justice isn’t reserved for deep-pockets. But after a sentence or two, I realized, to my dismay, that the piece merely echoed the growing chorus singing the praises of techno-enabled websites that deliver DIY or cut-rate legal services. But do these legal start ups really serve the underserved? To be sure, there’s a need for affordable legal services, which are priced at the upper end of even most middle class budgets. And the problem is far worse for the poor, where there are more than 6400 open cases for every lawyer willing to handle one pro bono, says the article. Still, how many of these cases can be resolved by forms or automation? An ABA survey of judges released a year ago found that pro se litigants suffer most in courtroom proceedings because of lack of training and courtroom experience. How-to guides may be useful for a small claims case, where procedures are relaxed — but they won’thelp pro se’s more effectively cross examine an adverse party or ensure that evidence makes it into the record in a formal proceeding. In fact, many past efforts to automate the wheels of justice have had disastrous results. Automated debt collection cases have clogged courtrooms with unfounded lawsuits while robosigners and bare-bones foreclosure teams caused much of the housing meltdown to begin with. Technology unchecked isn’t much better than unchecked lawyers. Meanwhile, services like Shpoonkle, that force lawyers into bidding wars, or capping legal fees at $89 for traffic ticket defense or $275 for a divorce aren’t all that much better. Granted, these services will get clients a warm body, which for truly simple matters may be all they need. But again, how much of a defense can a lawyer put on in a misdemeanor case that heats up when he’s only bid $500 to handle it? The trouble with many of these legal start ups is that they address the wrong problem. That’s because they begin with the assumption that the high cost of legal services is due to lawyers’ aversion to technology or greed. For example, one of the company founders quoted in the article talks about how lawyers spend 50 percent of their time copying and rearranging citations which grossly inflates their rates. Um, maybe that’s the case at some of the nation’s largest law firms, but most solo or small firm lawyers I know don’t do much photocopying since they run largely paperless shops – and rely on Shepardizing or lower cost law clerks or paralegals to cite check. Contending that lawyers don’t make use of technology is not only insulting, but just plain ignorant. Likewise, the article quotes an average billing rate of $284/hour which doesn’t say much either. Sure, $284 isn’t pocket change, but if a lawyer can resolve a matter in a couple of hours, the rate isn’t exorbitant. In fact, Legal Zoom isn’t much cheaper. Take a look at the $99 incorporation package. 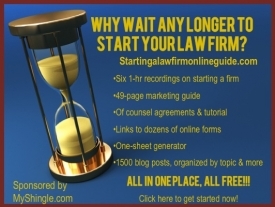 Many lawyers –even those without support staff — could easily bang out three Legal Zoom incorporations (total = $300) in an hour and wouldn’t even require a 7-10 day turn-around. The reason that many lawyers don’t is because they also spend time to understand clients’ goals and assist in selection of a business entity. Truth be told, if clients don’t want to pay for full service, many lawyers will direct them to incorporation forms available online or give them necessary forms for free . Of course, most of these tech start ups don’t realize any of this since they’re completely out of touch with how solo and small firm lawyers operate and what types of services would allow us to charge less or better help our client. That’s not surprising either, because if you take a look at many of these companies’ founders or board members, you’ll see that they’re comprised of Silicon Valley techies and big law expatriates who don’t have a clue as to many of the mundane factors that drive the cost of legal services. Like inefficient courts, where lawyers are often stuck waiting three hours for a case call and can’t work on any other matters in the process for fear of offending their client or the judge. (Solution: incorporate teleconferences or web for simple status calls or make wireless and work rooms readily available where lawyers can follow proceedings without sitting on a bench in the court) Or courts that don’t have e-filing and require lawyers to dispatch a messenger and make multiple copies every time they have to make a filing. And don’t even get me started on the cost of deposition and trial transcripts. Although video and voice recognition technology could eliminate the need for in-person reporters and the exorbitant $5.00/page cost per page, most courts won’t accept anything other than an official, reporter-prepared transcript – which can add thousands of dollars to civil suits and appeals. Then, there’s the cost of expert witnesses and investigators, which also take another chunk of change out of a case. None of the tech start ups do much to address these costs. In fact, by spending so much time braying about the high cost of legal services and pitting lawyers against each other to lowball fees, the tech start ups make the problem of access to justice even worse. After all, a lawyer who’s getting $2000 for a murder trial isn’t likely to blow $1000 on an investigator or an expert witness. Rather, he’ll dispense with those services to the detriment of his client. Moreover, tech companies incorrectly assume that technology is always the answer. Maybe so — but tech ain’t always free either. E-discovery search tools are far more powerful than combing through documents one page at a time — but many are really pricy and out of small lawyers’ price range. Other services with value-adds like legal briefs or expert write-ups that large firms can afford cost hundreds, if not thousands of dollars a year. True, there are forms and products available for solo and small firm lawyers, but truth be told, much of what I’ve seen so far (with the notable exception of Ken Adams’ NDA and a few others — please chime in if you’re one of them) are, quite frankly, garbage and insulting to solo lawyers and our clients. It’s no wonder that many lawyers have to resort to drafting contracts from scratch when the majority of available templates are completely subpar. From what I can tell, many of the newest generation of tech start ups aren’t using technology to improve the quality of legal services or lower the costs. Instead, they’re focused on bashing what lawyers do and trivializing the legal problems of the middle class and poor. These start ups aren’t trying to make good lawyers more widely accessible, or to help middling lawyers gain the tools to become better. Instead, they’re all about convincing the public why bottom feeders and robots and forms are good enough to serve the legal needs of the “common folk” when those same services won’t do for complex or important matters like multi-billion dollar mergers or a anti-trust actions. Ultimately, the tech start up companies widen the gap between haves and have nots by suggesting that it’s OK for a large portion of society to do without lawyers at all. Don’t get me wrong — technology can go a long way in improving the quality of legal services that we lawyers deliver to clients. For that, I need look no further than my practice, where I’ve been able to use out of the box tech like Adobe Acrobat and Google Maps and Box.net not just to handle, but to win cases against multi-million dollar companies that just five years ago would have been unthinkably expensive. But solving the problem of access to justice isn’t as simple as getting rid of, or deregulating all the lawyers or robotizing the practice of law. It also requires systemic changes like eliminating the administrivia that mean that a case may cost several thousand dollars even before a lawyer comes on board, and allowing lawyers to unbundle services in some instances without fear of malpractice and getting rid of the solo tax which can increase costs for solos as well. If legal technology start ups are really serious about access to justice and not just access to venture capital, then maybe they ought to start by talking to law firm start-ups; the solo and small firm lawyers who have a view from the trenches on why legal services cost so much what it takes to make equal access to justice a reality for all.